This quick knit broken rib cowl and headband pattern is fast and fun to make and it's so pretty you'll want to make more than one set. And it's also a great way for you to practice the broken rib stitch pattern too. This easy knitting project is simple enough for beginners which I love and it's also wonderful for all those experienced knitters that want a quick knit project to make. It's got just enough pattern in it to keep it interesting. And the best part is it's reversible! By the way this is a great quick knitting gift idea too. 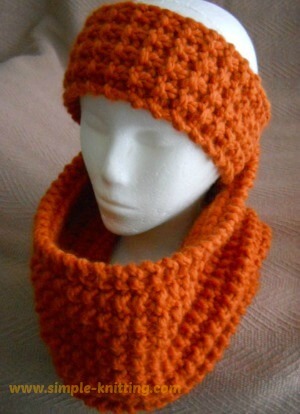 And I bet there's lots of people that will enjoy this broken rib cowl and headband when the cold winds start to blow. The great thing about this easy knitting pattern is that both sides look great too. The first picture below is the broken rib stitch side. And this is the reverse side with the rice stitch pattern (below). Wow, I like both! For this knitting pattern I decided to use ﻿Lion Brand Wool-Ease Thick & Quick.﻿ I don't normally use a lot of super bulky yarns but I really wanted a quick and easy knitting project. This yarn is great for that plus I loved all the color choices. Again though I understand some of you can't use wool products and you'll be able to use any super bulky yarns for this pattern. Size: Cowl is 29” long before seaming and approximately 8” wide. Headband is approximately 20” long and 3.5” wide. Notes: For the cowl I added 2 extra stitches for the edges, and on every row I slipped the first stitch as if to knit and I knit the last stitch. This size cowl took one ball of yarn and was approximately 29 inches long. If you want to make it longer just add a new ball of yarn and continue on in pattern. For the headband, rather than slip the first stitch of every row I knit it and gave it a good tug to keep an even edge and I knit the last stitch. Make sure to measure your head. 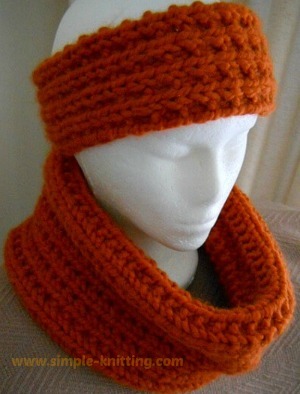 What you want to do is knit the headband about ½” - 1” shorter than the width of your head. It should fit nice and snug without being too tight. Finish: Seam ends together and enjoy. Repeat row 1 and 2 for approximately 19 or 20 inches ending with a knit row. Next Row: Bind off in ribbing. Finish: Sew up seam and enjoy.